Grand Rapids' new mayor set out an ambitious list of goals addressing racial disparity, housing and environmental sustainability in her first State of the City Address. 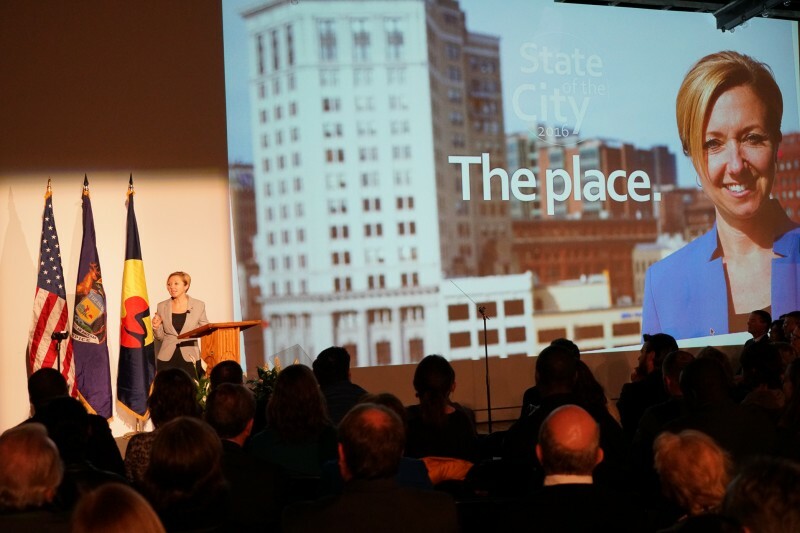 Following her State of the City address tonight, Mayor Rosalynn Bliss will hold Neighborhood Meetings Monday, February 8-11. Bliss says she wants to hear from residents, emphasize points from her address and answer any questions residents may have. 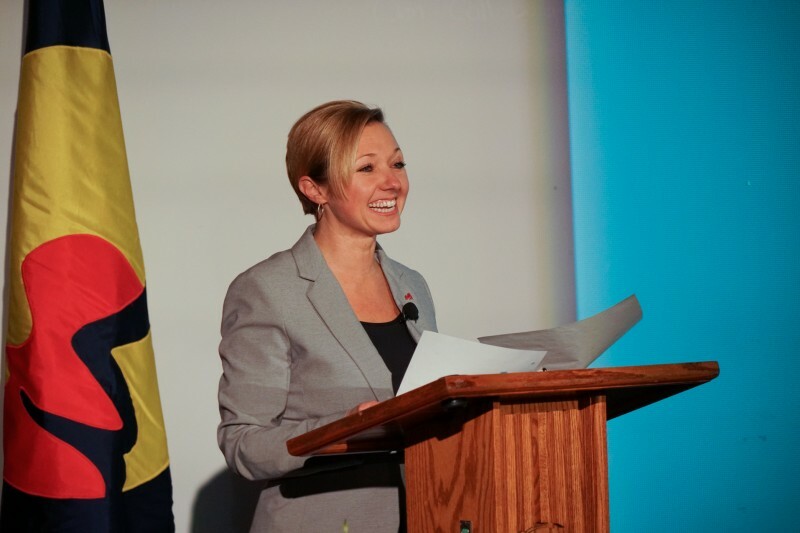 Mayor Rosalynn bliss declared that racial disparity in Grand Rapids is “unacceptable” in her first state of the city address. 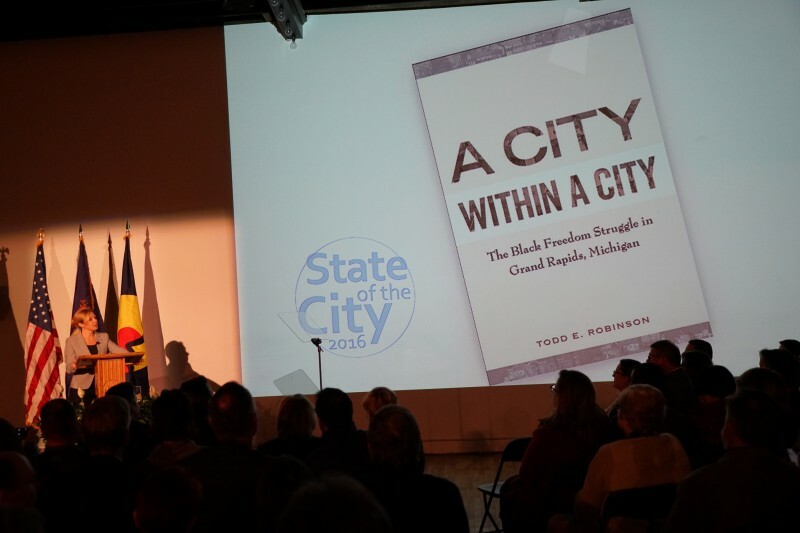 In a speech filled with bold goals, Bliss’ promises to improve racial equity, affordable housing to Grand Rapids residents drew the greatest audience response. "We must confront a difficult issue that has grown to an unacceptable proportion in our city," Bliss said. "It starts with how the city government looks and how we think. We have to learn to honestly assess our own biases, and know how those biases impact others, specifically in how they result in denying opportunities for others." 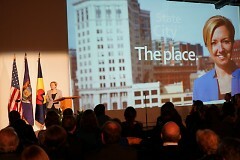 The state of the city address took place on Tuesday, February 2, one month after Bliss ended a 10-year span on the City Commission to become the first woman mayor of Grand Rapids. A packed audience, including notable public officials such as Mayor of Kalamazoo Bobby Hopewell and State Representative Winnie Brinks, crowded together to hear Bliss’ address on the second floor of the Harris Building, located on South Division. Bliss described the Harris building, a renovated structure that stands on the former site of a brewery and furniture company, as exemplifying the connection between Grand Rapids’ history and upcoming changes. Grand Rapids’ step to the future, according to Bliss, would start with reducing racial inequality. Bliss pointed out the economic divide between white and minority residents of Grand Rapids, citing statistics that show 42% of African American residents of Grand Rapids live below the poverty line. “There is a sense of hopelessness,” said Bliss in regard to African Americans and Latinos seeking employment and economic success in Grand Rapids. To foster racial equity, Bliss called for a friendlier climate for small, minority-owned startup businesses and food trucks and announced her intention for city government to hire more minority youth members. Bliss also stated her intention to improve police-community relations by completing the 12-point community relations plan for the Grand Rapids Police Department, which includes measures such as implicit racial bias training, using data analysis to track racial profiling and increased open house hours. The GRPD did not meet the deadline for four of the proposed twelve points of the plan, but will begin using body cameras starting next month. Bliss’ calls to complete the 12-point plan came followig the recent controversial purchase of 65 rifles for Grand Rapids police vehicles. “We want all citizens to see every police officer as their community officer,“ said Bliss. In addition to racial equity, Bliss pledged to make affordable housing a priority. “I will ask the City Commission to join me in the establishment of a housing fund that can be used to start to build a stable and effective way to help ensure long-term financing for affordable housing,” said Bliss. Additional plans for housing included more aggressive restrictions on urban blight and the provision of a neighborhood matching fund, which would provide mini grants to neighborhoods building projects such as parks, community gardens and public art. Bliss hopes that the City Commission would set aside $50,000-$100,000 for the matching fund, but recognized the need to hash out the details during the budget-making process. Other items on Bliss’ agenda included the development of 100 miles of new bike lanes by 2017 and the complete use of renewable resources for public buildings by 2025. 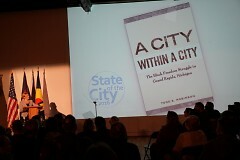 Bliss’ address drew connections to past accomplishments of the Grand Rapids City Commission, but made little mention of former mayor George Heartwell. Toward the end of his term as mayor, Heartwell drew attention for his use of the bully pulpit to address national issues such as gun control and fracking. Bliss focused mainly on matters faced directly by Grand Rapids residents and her vision for Grand Rapids’ future. “I am confident that all of us,” said Bliss, "working together, can build this vision."